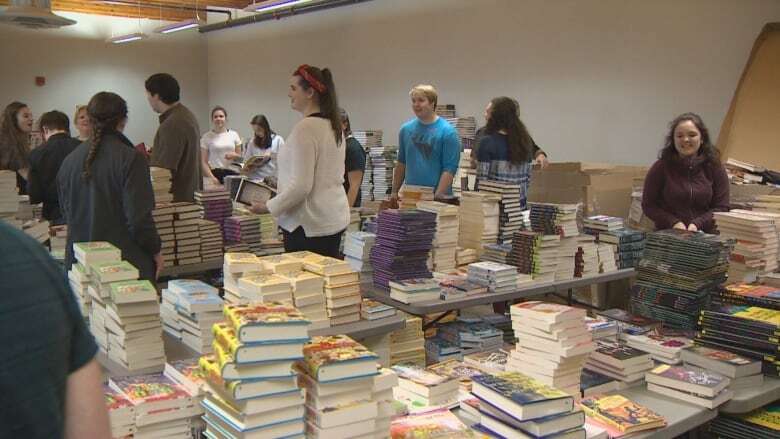 High school students from Quispamsis have been busy transforming an empty room at Saint John's Nick Nicolle Community Centre into the province's inaugural First Book Canada pop-up shop. 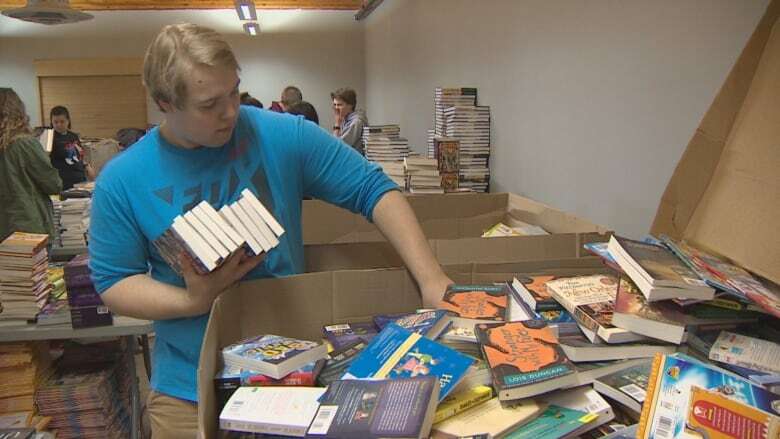 Kennebecasis Valley High School students unpacked, sorted and stacked pallets of books that will be distributed at no charge to youth across the province as part of an effort to reduce barriers to reading. During the two-day pop-up bookshop, which runs Tuesday and Wednesday, about 200 representatives from New Brunswick schools, businesses and organizations will stop in to choose through thousands of English books for youth ages 18 and under. Dr. Erin Schryer, executive director of Elementary Literacy, a New Brunswick reading-based program, said the representatives will then distribute the books to children in need. "We know that children learn to read by reading," Schryer told CBC News. "They need to practise their skills, and one of the biggest things and barriers to that is access to books. Many of us may not think that's a reality, but it is." 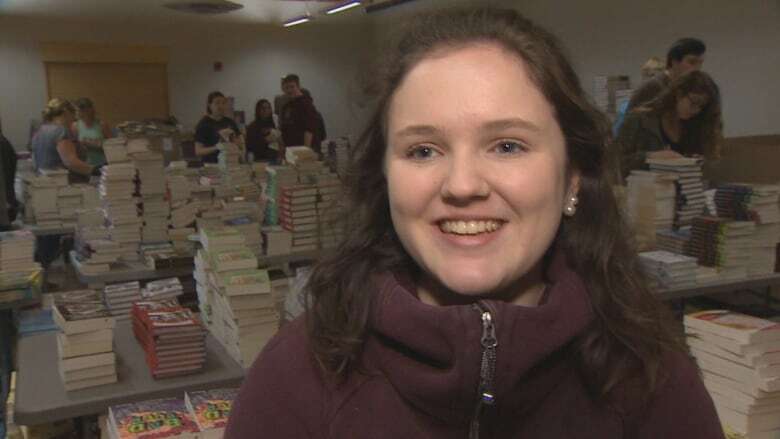 She said Saint John's north end, a lower-income part of the city, is a prime example of where access to books can be limited, often because of the cost. Saint John has a great public library, she said, but studies show that a robust home library is important for the child's development. First Book Canada is a national non-profit organization that works with publishers to donate books for kids. The organization holds temporary bookshops to help distribute them in the community, and it reached out to Schryer because one had never been held in New Brunswick. The national organization did not collect any French books because it didn't know there were French schools in New Brunswick, Schryer said. Paula Galbraith, a KVHS teacher, brought her history class to help out as a way to get students more involved in their community. "We're learning in history the importance of education and how it changed many different governments and society," Galbraith said. "If people read, they have the opportunity to have adventures they wouldn't otherwise be able to afford. They have the opportunity to gain new information, to be more well-rounded citizens." For senior student Haley Northrup, who grew up surrounded by books, the morning's labour was well worth it. "It makes me really sad to know not a lot of kids in our community get to grow up with books, so I love that these are going to people in need," Northrup said. "It's been really awesome for us to come together and work together as a group. It's fun to do this for the betterment of our community."